The way constant is without name. Simple! Though small, nothing under heaven can subjugate it as well. All things would take the role of guest. The people, of none decree, yet self balanced. Only when restricted, are there names. Man handles the realization to stop. Knowing to stop [he] can be without danger. Liken this to the river of the valley flowing to the great river and the sea. Go to Kirk Garber’s YouTube channel for audio recordings of our monthly Sunday meeting. These come in two parts for each chapter. The shorter first part is a chapter reading followed by attendees’ commentary, if any. The second longer part is an open discussion of how the chapter relates to personal experience. This morning I felt simple to be like consciousness, the light, or rather the light of consciousness that illuminates the ‘presence of existence’. That is the only constant I’ve ever experienced and it has been constant for as long as I can remember. This is the simplest link that connects all the dots of my life, so to speak. This reminds me of D.C.Lau’s line in chapter 14, The ability to know the beginning of antiquity is called the thread running through the way. Nothing under heaven can subjugate it because it lies at the foundation of everything. The literal translation of this line in chapter 14 puts it this way: The ability to know the ancient beginning, this is called the way’s discipline. The way’s discipline may describe the process better, for me anyway. Still, I do love the poetry of the thread running through the way. Discipline is a useful way to describe the ‘presence of existence’ that underpins everything — from the spin of an electron to the forces behind a galactic spiral. No wonder it’s without name. By the way, quantum non-locality offers hints of proof that consciousness is universal and immortal, which sheds more light on why Nothing under heaven can subjugate it as well. The following are previous posts that delve into non-locality: Beyond Spooky, Seat of Consciousness, Consciousness Physics, and finally, You are Immortal, which probes into the ‘illusion of self’ clinging experience vis-à-vis consciousness. Everyone experiences this sense of immortality in moments of emotional and mental tranquility. Yet, few would recognize it as immortal consciousness! It helps to know what you are looking for to find it, or in this case realize you found it. Invite ‘nature’ in, and then alone and still, breathe in and smell, look, touch, and ‘feel’ all living things past and present who have experienced the same. You will become them, not in your imagination, but because of diminishing whom you think you are. As the self-illusion wanes, the immortal Universal Self waxes, so to speak. Note: ‘nature’ is a state of mind, not a thing or place. Of course, biologically speaking, I suppose mirror neurons are involved. Still, they are only another aspect of ‘nature’. These passages can help put you in the mood. Without going out the door, we can know all under heaven. This passage from chapter 47 above hints at what we’ll see as the illusion of self fades away. In other words, the illusion of self overshadows the larger reality within which the illusion exists. Chapter 4 points the way, Soften its brightness, be the same as its dust. As the example of the animat suggests, integrated information may not be restricted to just objects in possession of a brain. Such a simple finding has a big implication: If Tononi is right, and integrated information actually is consciousness, then consciousness itself is no longer restricted to the inside of a head. As long as it has the right informational specs, any system, whether it’s made of nerve cells, silicon chips or light beams, could possess consciousness. Expanding the umbrella of consciousness to include systems that don’t have brains, a view echoing that espoused by some ancient religions and more modern versions of panpsychism, is an uncomfortable stretch for many researchers. Seth, for one, believes the mathematical language of consciousness offers interesting descriptions but stops short of saying that integrated information is actually the thing itself. “The only systems that we know of in the universe that generate consciousness are biological,” he says. Whether consciousness is woven into the very nature of the cosmos is a grand question that, for now, remains unanswerable, Koch says. But that hasn’t hindered real progress on other questions about the mind. Systematic studies and leaps of insight have revealed what’s required of a conscious brain, traced a particular sight as it journeys into awareness and produced a crop of theories that hint at the true nature of consciousness. Guided by theoretical insights, scientists may someday escape the confusion that comes from being their own subjects, and see clearly into the minds of man. An understanding of what lies within the skull may then inspire scientists to shift their gazes outward, where an entirely new and mysterious world awaits. ‘Great men, if able to observe it’ describes the moments when I am able to slough off names (labels) and savor the moment. At such times of cognitive stillness, I’m able to ‘bask’ in the light of the constant. At those moments, I do take the role of guest for then I have no agenda. I also feel, the people, of none decree, yet self balanced. I consider all perceptions truly be merely reflections and projections of ‘in here’ — my inner makeup. Everything ‘out there’ appears self balanced precisely and only in the moments when I am self balanced. There is always a tradeoff. Here, in restricting the way through naming we gain power, control, and the security of virtual knowing. We lose the connective experience that comes from non-differentiating consciousness — profound sameness, as chapter 56 puts it. This differentiating practice is increasing exponentially with technology. Just think, in little more than a century we’ve gone from horse and buggies to self-driving cars and moon landings. Yet, as a species, we cheer on these advancements completely oblivious to the tradeoff, the unintended ‘evil’ consequences, they naturally and inevitably incur. Knowing to stop [he/she] can be without danger. Each person handles the responsibility to stop. Stop what, you may ask. This isn’t about stopping to name anything really, even if that were possible. The real damage of naming realities lies in how tightly you hang on to the names, and the broader definitions for the names. How you define words determines how tightly words trap your mind; it’s something like a self-fulfilling prophesy. The only meaning names have is the meaning you emotionally give them. Knowing to stop [he/she] can be without danger therefore begins at an emotional level. It’s deep! This means it’s an intuitive emotional knowing, not an intellectual one. It is more accurate to say, an intuitive un-knowing, or perhaps a recalibration. 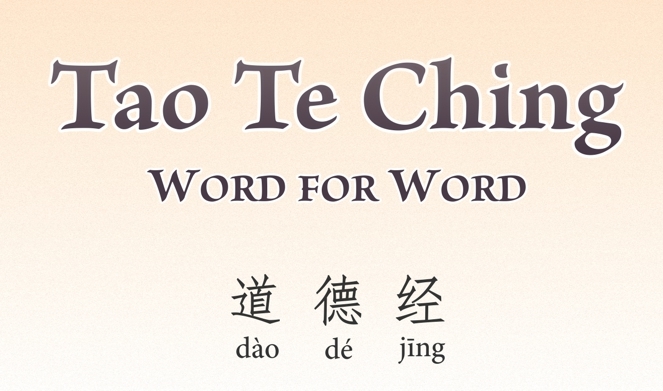 See Tools of Taoist Thought: Correlations if you want to try out a way to liberate your mind from Names.